ProgeCAD Pricing from AxonWare. Get ProgeCAD iCADMac 2018 Eng/Deutsche ver. Order Online from the leading ProgeCAD discount reseller in Europe. Ph: +353 1 6535178. AxonWare the best place to buy ProgeCAD. Looking for a DWG CAD for your Mac? iCADMac is the first 2D/3D DWG and DXF CAD solution for MAC OS X that opens, saves and draws directly in AutoCAD® native format. Send and edit your DWG files FREE from iCADMac to iPad™. The files modified on iPad™ can be transferred back to your iCADMac with just a click. Send your DWGfiles from your Mac to visualize on the iPad™ in the optimized and protected PDF format. 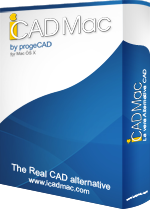 iCADMac is user friendly 2D/3D CAD software for MAC OS X, which reads and writes DWG format drawing files. It is easy to use thanks to the high level of compatibility with AutoCAD, and it is easy to get as you pay far less money to obtain economic licensing solutions. These characteristics make the software the ideal choice for those who search for the lowest cost for designing, revision and creating technical documentation, without giving up the quality and compatibility included in the market standard. NEW: 3D PDF Export. Create ADOBE PDF standard with your dynamic 3D content inside. PDF3D allows to communicate to all the globe and share your data with anyone in an easy and innovative way. Smart collaboration with your draftsmen and designers as well as users who do not deal with CAD software. iCADMac is the only DWG CAD for Mac supporting this feature. Advanced module will be available soon as an option module. ACIS Solids Modeler - Display and create of ACIS® solids (the same modeller within AutoCAD®). - Polygonal Viewports with clipping: the ClipViewport command lets you clip the display of Viewports on the current Sheet at irregular shapes. - CALLOUT: Use the Callout command to place boxed mark-up text in drawings with an arrow pointing to an object or location in the drawing. - Enhanced performance of loading, rebuilding, and saving large files and less memory consumption. - SMARTCALCULATOR: Use the SmartCalculator command to display the Calculator dialog box to perform mathematical and trigonometric computations and measurement conversions. You can use the command transparently. - PDF Export Improvements. Support of PDF output options such as grayscale output, PDF layer support, TrueType font embedding, and document properties support. - New command CLOUD with options (Rectangular, Elliptical, Freehand): Use the Cloud command to create revision clouds. Revision clouds are used in drawings to indicate that certain areas require or contain revisions. You can create rectangular, elliptical and freehand Clouds to accentuate drawing areas. You can adjust the radius of the sequential arcs of Clouds. - New command SMARTLEADER: draws Leader lines that connect annotations to a drawing entity. - New command LOFT: creates a new solid object or surface by specifying a series of cross sections. - Field : You can add Fields to annotations. Use Fields to update visible information such as modification date, drawing name, and author. For example, with Fields you can keep text in title blocks accurate.Fields are updated automatically when you save, print, or rebuild drawings. - New command VOICENOTE: allows to record audio notes and embed them in drawings. User friendly: Customizable interface that is familiar to CAD users. >br> Economic and complete: iCADMac costs just a fraction of the cost of competitors, yet offers similar functions. iCare services are available for iCADMac. Direct technical assistance and access to all the updates and new versions. Unlimited access to the clients area. Online Helpdesk. iCADMac is available with different licensing solutions: - Single License: Quick and immediate. For a single Mac Pro, MacBook Pro; iMac; Mac mini; MacBook Air; MacBook - USB-dongle License: this license with a USB-dongle protection allows to transfer your license from between Mac Pro, MacBook Pro, iMac, Mac mini, MacBook Air or MacBook - Network License: allows to share licenses in the net. Can be installed on unlimited computers in the net and used at the same time by several users according to the purchased licenses (1 NLM=1 concurrent user). The number of network floating licenses determines how many users can work with the product concurrently, so in accordance with this the necessary number of licenses should be acquired.